The Free Style Libre system does not require blood to be pricked from your finger. NHS Grampian is testing a new medical device which allows people with diabetes to measure their blood sugar levels without pricking their fingers for blood. 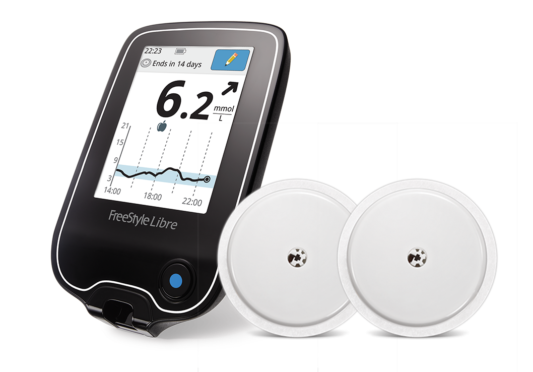 The Free Style Libre monitoring system allows children and adults with type one diabetes to measure their glucose levels through their skin. The technology works by measuring the fluid which surrounds the cells of tissue below the skin with a special sensor, worn on the arm. Patients can scan the sensor with a mobile phone app to find out more information on their blood glucose levels, and find out how they are changing over time. Although the device came onto the market at the end of last year, it has just recently become available to certain NHS Grampian patients following the advice of various groups and a policy review. It is only to be used by people with type one diabetes who have received the proper training and use intensive insulin treatment. The health board plans to initially offer around 120 training places per month for those eligible to allow them to use the new medical technology. It is hoped that the device’s ability to make measuring easier will encourage patients to record their blood sugars more frequently, and use that information to manage their diabetes more efficiently. Banffshire and Buchan Coast MSP Stewart Stevenson said: “It is a positive step forward to see how NHS Grampian is helping to support and invest in new methods of glucose monitoring for those with type one diabetes. “Patients eligible to take part will be given clear instructions on how to use the system, and could help inform trends in a way that current finger prick testing does not. “Type one diabetes patients who take part in this programme may be helping those with the condition now and in the future, helping provide researchers with information they do not currently have.